Abu Dhabi: The occupied islands of Abu Mousa, Greater and Lesser Tunbs will sooner or later return to the UAE, the Foreign Minister told the Federal National Council (FNC) on Tuesday. Shaikh Abdullah Bin Zayed Al Nahyan pledged before the House that the UAE will not only recover its land but also oil and other resources exhausted by Iran, which has occupied the three islands since 1971. "The UAE's rights will be restored, no matter how long it takes, and here I am speaking of not only land, but also resources exhausted as the country will not tolerate any attack on its rights in any way," Shaikh Abdullah said. While stressing that the occupation of the islands negatively affects relations between the two countries, Shaikh Abdullah said it does not create hurdles developing economic ties with Iran. "There are some countries which have taken it upon themselves to protest the occupation of our islands while directing criticism at the UAE for its economic dealings with Iran. Those countries are acting in a hypocritical manner. A more effective response to this issue can alternatively be achieved through a unified Arab stand on all our national issues," Shaikh Abdullah said, without naming any country. He stressed occupation of a single plot of Arab land is occupation of all Arab lands, "however, I am obliged to feel more concern for the occupation of my land than that of others." 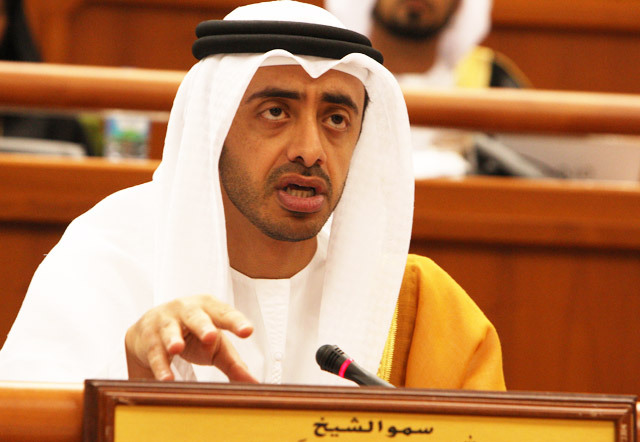 Shaikh Abdullah urged all citizens to support Emiratis under occupation in Abu Mousa. "Access to hundreds of Emirati families living in Abu Mousa is near impossible. Offering them assistance, services or building materials is impossible. The Iranian side refuses to provide them with teachers, doctors and nurses." Shaikh Abdullah called on the media to highlight the plight of Emiratis living in Abu Mousa under the Iranian occupation, who are deprived of any care, despite efforts being made by the Federal Government and Sharjah.